Notes: In 1905 steam railmotors were introduced between Oxford and Bicester to attract new commuters from the growing suburbs around Oxford. These were later supplemented by the 'Michelin', a prototype petrol railmotor. 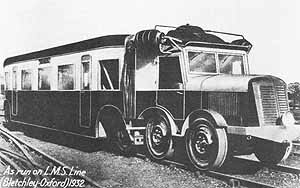 The Micheline was a 24 seater vehicle running on pneumatic tyres which are were adapted for use on railway tracks and propelled by an internal combustion engine. At the same time six new halts were built between Oxford and Biscester at Summertown, Wolvercote, Oxford Road, Oddington, Charlton and Wendlebury; they were all unstaffed with tickets being sold by the conductor. The six halts were withdrawn from service during WW1 (1.1.1917) and reinstated after the war (5.5.1919). The service was once again withdrawn in 1926 during the General Strike and with the introduction of new bus services never reinstated. The Halt was opened as Summertown, being renamed Port Meadow on 1.1.1907. 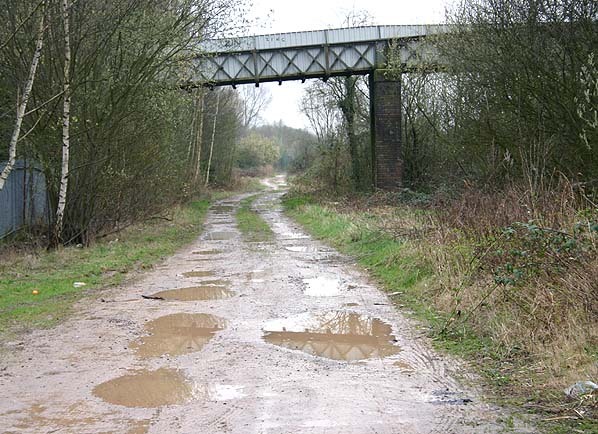 Although the track has been lifted on this final section of the route into Oxford Rewley Road the course of the line is still largely intact with no public access. The first railway came to Oxford in 1844 when the GWR opened its line from Didcot. In 1847 the Buckinghamshire Railway Company was formed to promote two lines, one between Oxford and Bletchley with the second running north to Banbury from a junction near Winslow. Construction of the Banbury line started first on 20th April, 1847 with work starting on the Oxford line on 13th June 1848. The line to Banbury opened first on 1st May, 1850 with a 16 mile section of the Oxford line between Bletchley and Islip opening on the 1st October, 1850. The remaining section between Islip and Oxford was more problematic. The company had originally hoped to run into the GWR station at Oxford with a junction with the Oxford, Worcester & Wolverhampton Railway north of the city. The GWR wouldn't allow this however and after several other proposals were also rejected the final solution was to build a parallel line into a new terminus at Oxford adjacent to the GWR station. A temporary terminus at Banbury Road (Oxford Road) on the outskirts of Oxford was opened on 2nd December, 1850 while negations were underway to acquire land for the extension into the city. The new terminus was on the site of Rewley Abbey, a Cistercian Monastery that dated from 1287. To reach Oxford the line had to cross the Oxford Canal or navigable branches of the canal on its approach to the terminus and the railway company was forced to build a number of bridges one of which was a swing bridge over the Sheepwash Channel, a navigable link between the Oxford Canal and the River Thames. The final section of the line into Oxford was finally opened on the 20th May, 1851 with stations on the Oxford to Bletchley line at Islip, Bicester, Claydon and Winslow. Stations were later added at Swanbourne (by October 1851), Launton (1852), Verney Junction (1868) and Marsh Gibbon & Poundon (2.8.1880). Initially only the section between Bletchley and Claydon was double track but the remaining section of the line between Claydon and Oxford was doubled in 1854. From the outset the Buckinghamshire Railway was worked by the London & North Western Railway. From 1st July 1851 the LNWR leased the line for 999 years before finally absorbing it in 1879. The Bletchley to Bedford line had opened in 1846 and the opening of the Bedford to Cambridge line in 1862 provided an important cross country link between Oxford and Cambridge forming one of the few east-west routes, with the capability of reaching the east coast ports. Most services however ran from Oxford to Bletchley and from Bletchley to Cambridge. The Second World War intensified traffic on the line like never before. The largest single development of that period being the Bicester Military Railway. With the return of peace and the nationalisation of the run down railway network the newly formed British Railways board was looking to close unprofitable lines. The terminus at Oxford Rewley Road closed on 1st October 1951 just over a 100 years after it had opened and trains we rerouted into the old Great Western station. The line between Oxford and Bletchley remained in use for freight, empty stock movements and occasional enthusiasts' specials. The section between Oxford & Bicester London Road was reopened on 15.5.1989 and in 2001 the Strategic Rail Authority looked into reopening the remaining part of the line for passengers between Bicester and Bletchley but this proposal has now been rejected. The junction at Bletchley was severed some years ago and the track has now been lifted back to Swanbourne. Between Swanbourne and the junction with the Great Central at Claydon a single track is still in situ but now heavily overgrown and out of use; level crossing gates have been removed and replaced with permanent fencing. This section is officially listed as 'mothballed'. From Claydon Junction to Oxford the line is in regular use as part of the freight line between Aylesbury and Oxford.